The world of finance is again undergoing crisis and transformation. This book provides a new perspective on finance through the prism of popular and formal culture and examines fascination and repulsion toward money, the role of governments and individuals in financial crises and how the Crisis of 2008, like others since 1720, repeat the same patterns of enthusiasm, greed, culpability, revulsion, reform and recovery. The book explores the political and socio-economic factors which determine fallibility and resilience in financial cultures, periods of crisis, transition and recovery based on cyclical rather than linear progression. Examining the roots of financial capitalism, in Europe and the United States and its corollary development in Asia, Russia and emerging markets proves that cultural and psychosocial reactions to financial success, endeavor and calamity transcend specific periods or events. 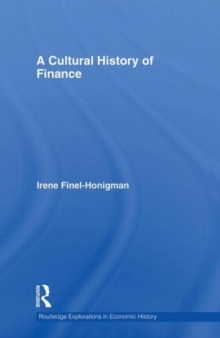 The book allows the reader to discover parallel and intersecting reactions, controversies and resolutions in the cultural history of financial markets and institutions.